The Biggest Issue No One Is Talking About in the British Election: Could Britain Really Leave the EU? Could Britain Really Leave the EU? 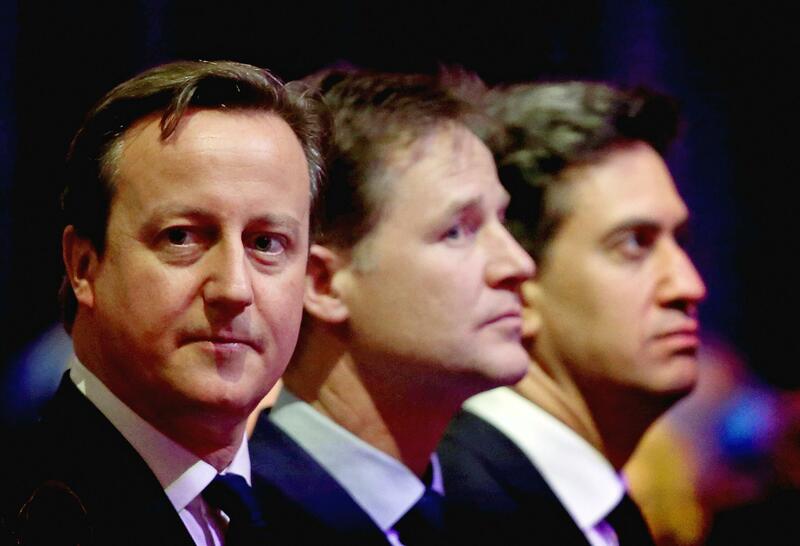 From left, Prime Minister David Cameron, Deputy Prime Minister Nick Clegg, and Leader of the Labour Party Ed Miliband. While none of the candidates have spent all that much time talking about it, the biggest question of Thursday’s British election is whether Britain will remain in the European Union. If the Conservatives stay in power after Thursday, Prime Minister David Cameron has promised to hold a referendum on British membership in the EU by 2017. His main challenger, Ed Miliband, has said a referendum will be “unlikely” if Labour takes over 10 Downing Street. A referendum would be a nail-biter: Polls show Brits split evenly on the question of whether to pull out of the union. While some members of his party favor pulling out altogether, Cameron has said he will campaign to keep Britain in the union but wants to renegotiate the terms of its membership. European governments have been skeptical of that idea. As French Foreign Minister Laurent Fabius put it, “If you join a soccer club, you cannot play rugby half way through.” They will be even more skeptical if Cameron’s conservatives end up forming a coalition with the populist Euroskeptic UKIP party. Britain’s relationship with the union has always been prickly, but an all-out exit would be a serious political blow to the EU project. The election is being watched closely in Europe; France’s Le Monde reports that European officials are consciously avoiding discussing any issues that might annoy British voters. How would a “Brexit” change things in Brussels? On economic policy, it would tip the balance in favor of more protectionist, interventionist countries, and away from the more free-market, pro-austerity bloc led by Germany. It would also leave Germany taxpayers to pick up much larger share of the EU budget. On foreign policy, Britain, which spends more on defense than any other European country, has sided with the EU’s newer members in Eastern Europe to support strong sanctions against Russia over more skeptical countries like France and Italy. If it bolts, Europe will be less likely to maintain the sanctions. The U.S. definitely wants to keep Britain as its staunchest ally within the union. In some ways, the election is a lose-lose for Britain’s political allies in the EU. If the Conservatives win, there’s a serious risk of Britain pulling out altogether, leaving them stranded. If Labour wins, they get a British government much more skeptical of austerity and much less committed to hawkish defense policies. The latter is especially true if a Labour government is joined by the Scottish National Party, which favors scrapping parts of the country’s nuclear deterrent. The issue has been a tricky one for the British candidates. Many of Cameron’s prospective voters strongly favor an exit, and Cameron’s needed to keep them from fleeing to UKIP. But he also wants the support of the business community, which doesn’t want to lose access to the European market. Labour’s voters are more pro-European, but the idea of taking away the right of voters to have a say on the issue isn’t much of a winner. So despite its importance, for both the future of Britain and the rest of the continent, it’s not surprising that no one really wants to talk about it.